رودینی, قدرت اله, خسروی, مرتضی, خمری, محسن. (1397). بررسی خواص مقاومت فشاری و ضربه کامپوزیت آلومینیوم- گرانول آلومینا تولید شده به روش ریخته‌گری تحت فشار. علوم و فناوری کامپوزیت, 5(3), 387-394. قدرت اله رودینی; مرتضی خسروی; محسن خمری. "بررسی خواص مقاومت فشاری و ضربه کامپوزیت آلومینیوم- گرانول آلومینا تولید شده به روش ریخته‌گری تحت فشار". علوم و فناوری کامپوزیت, 5, 3, 1397, 387-394. 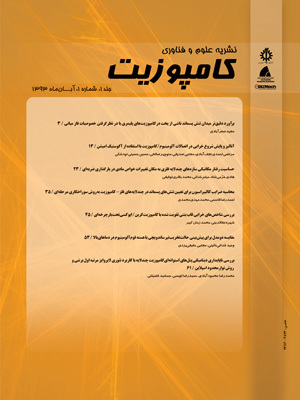 رودینی, قدرت اله, خسروی, مرتضی, خمری, محسن. (1397). 'بررسی خواص مقاومت فشاری و ضربه کامپوزیت آلومینیوم- گرانول آلومینا تولید شده به روش ریخته‌گری تحت فشار', علوم و فناوری کامپوزیت, 5(3), pp. 387-394. رودینی, قدرت اله, خسروی, مرتضی, خمری, محسن. بررسی خواص مقاومت فشاری و ضربه کامپوزیت آلومینیوم- گرانول آلومینا تولید شده به روش ریخته‌گری تحت فشار. علوم و فناوری کامپوزیت, 1397; 5(3): 387-394. کامپوزیت های زمینه فلزی الومنیوم - الومینا با خواص فیزیکی و مکانیکی مناسب از مواد مدرن مهندسی هستنند. این کامپوزیت ها بطور وسیع در بسیاری از صنایع ( هوا-فضا ، اتو مبیل ، الکترونیک و غیره ) استفاده می شوند. در این پژوهش پیش فرم گرانول آلومینا با اندازه ها مختلف (µm100-20) تولید و در دماهای °C 1300 و°C 1400 و به مدت زمان دو ساعت سینتر شدند. سپس انها در دمای °C 700 و به مدت یک ساعت پیش گرم شدند. سپس پیش فرم های گرانول الومینا بوسیله مذاب الومنیوم با فشار MPa 3 با روش ریخته گری تحت فشار فلزخورانی شدند.. بعد از ساخت کامپوزیت ها خواص ساختاری انها با استفاده از میکروسکوپ نوری و الکترونی روبشی مطالعه شد. نتایج حاصل از بررسی ریز ساختاری نشان دادکه در دما ی بالای سینترینگ مقدار حفرات کم و درات الومینا به خوبی به همدیگر متصل شده اند. همچنین خواص مکانیکی استحکام فشاری ، استحکام ضربه و میکروسختی نیز در کامپوزیت ها بررسی شد. نتایج نشان داد که افزایش دمای سینترینگ گرانول آلومینا، باعث افزایش استحکام فشاری و سختی کامپوزیت می شود ولی مقاومت به ضربه کاهش می یابد. 1Department of Materials Engineering, University of Sistan and Baluchestan, Zahedan, Iran. Roudini, G. and Asgharian, A. and Khosravi, M., "High Volume Fraction Aluminum /Alumina-Fused Silica Hybrid Particulate Metal Matrix Composite," Advanced Materials Research, Vol. 701, pp. 3-7, 2013. Sharmaa, P. and Sharmab, S. and Khandujaa, D., "A Study on Microstructure of Aluminium Matrix Composites," Journal of Asian Ceramic Societies, Vol. 3, pp. 240–244, 2015. Bodunrina, O. M. and Alanemea, K. K. and Chownb, L. H., "Aluminium Matrix Hybrid Composites: a Review of Reinforcement Philosophies; Mechanical, Corrosion and Tribological Characteristics," Journal of Materials Research and Technology, Vol. 4, pp. 434-445, 2015. Rosso, M., "Ceramic and Metal Matrix Composites: Routes and Properties," Journal of Materials Processing Technology, Vol. 175, pp. 364–375, 2006. Chawla, N. and Chawla, K. K., "Metal Matrix Composites," Springer, New York, 107, 2006. Singh, J. and Chauhan, A., "Characterization of Hybrid Aluminum Matrix Composites for Advanced Applications– a Review," Journal of Materials Research and Technology, Vol. 5, pp. 159-169, 2016. Sharma, S., "The sliding Wear behavior of Al 6061-garnet Particulate composites," Wear, Vol. 249, pp. 1036-45, 2001. Avettand-Fènoël, M. N. and Simar, A., "A Review About Friction Stir Welding of Metal Matrix Composites," Materials Characterization, Vol. 120, pp. 1-17, 2016. Khoramkhorshid, S. and Alizadeh, M. and Taghvaei, A. H. and Scudino, S., "Microstructure and Mechanical Properties of Al-Based Metal Matrix Composites Reinforced With Al84Gd6Ni7Co3 Glassy Particles Produced by Accumulative Roll Bonding," Materials and Design, Vol. 90, pp. 137-144, 2016. Kaczmara, J. W. and Pietrzakb, K. and WoosinÂskic, W., "The Production and Application of Metal Matrix Composite Materials," Journal of Materials Processing Technology, Vol. 106, pp. 58-67, 2000. Pandi, G. and Muthusamy, S., "A Reiew on Machining and Tribological Behaviors of Aluminium Hybrid Composites," Procedia Engineering, Vol. 38, pp. 1399-1408, 2012. Zabihi, M. and Toroghinejad,M. R. and Shafyei, A., "Shear Punch Test in Al/Alumina Composite Strips Produced by Powder Metallurgy and Accumulative Roll Bonding," Materials Science and Engineering A, Vol. 667, pp. 383-390, 2016. Kouzeli, M. and Dunand, D. C., "Effect of Reinforcement Connectivity on The Elasto-Plastic Behavior of Aluminum Composites Containing Sub-Micron Alumina Particles," Acta Mater, Vol. 51, pp. 6105-6121, 2003. Dabade, U. A. and Jadhav, M. R., "Experimental Study of Surface Integrity of Al/SiC Particulate Metal–Matrix Composites in Hot Machining," Procedia CIRP, Vol. 41, pp. 914-919, 2016. Bodukuri, A. K. and Eswaraiah, K. and Katla Rajendar, K. and Sampath, V., "Fabrication of Al-Sic-B4C Metal Matrix Composite by Powder Metallurgy Technique and Evaluating Mechanical Properties," Perspectives in Science, Vol. 8, pp. 428-431, 2016. Hodder, K. J. and Izadi, H. and McDonald, A. G. and Gerlich, A. P., "Fabrication Of Aluminum–Alumina Metal Matrix Composites Via Cold Gas Dynamic Spraying at Low Pressure Followed by Friction Stir Processing," Materials Science and Engineering: A, Vol. 556, pp. 114-121, 2012. Wu, C. and Ma, K. and Wu, J. and Fang, P. and Luo, G. and Chen, F. and Shen, Q. and Zhang, L. and Schoenung, J. M. and Lavernia, E. J., "Influence of Particle Size and Spatial Distribution of B4C Reinforcement on The Microstructure and Mechanical Behavior of Precipitation Strengthened Al Alloy Matrix Composites," Materials Science and Engineering: A, Vol. 675, pp. 421-430, 2016. Zare, H. and Jahedi, M. and Toroghinejad, M. R. and Meratian, M. and Knezevic, M., "Compressive, Shear, and Fracture Behavior of CNT Reinforced Al Matrix Composites Manufactured by Severe Plastic Deformation," Materials and Design, Vol. 106, pp. 112-119, 2016. Rahimian, M. and Parvin, N. and Ehsani, N., "Investigation of Particle Size and Amount of Alumina on Microstructure and Mechanical Properties of Al Matrix Composite Made by Powder Metallurgy," Materials Science and Engineering A, Vol. 527, pp. 1031-1038, 2010. Alhajeri, S. N. and Al-Fadhalah, K. J. and Almazrouee, A. I. and Langdon, T. G., "Microstructure Andmicrohardness of an Al-6061 Metal Matrix Composite Processed by High-Pressure Torsion," Materials Characterization, Vol. 118, pp. 270-278, 2016. Saleh, K. and Vialatte, L. and Guigon, P., "Wet Granulation in a Batch High Shear Mixer," Chemical Engineering Science, Vol. 60, pp. 3763-3775, 2005. Lin, C. S. and Lin, S. T., "Effects of Granule Size and Distribution on the Cold Isostatic Pressed Alumina," Journal of Materials Processing Technology, Vol. 201, pp. 657–661, 2008. Shafiee Afarani, M. and Samimi, A. and Bahadori Yekta, E., "Synthesis of Alumina Granules by High Shear Mixer Granulator: Processing and Sintering," Powder Technology, Vol. 237, pp. 32-40, 2013.